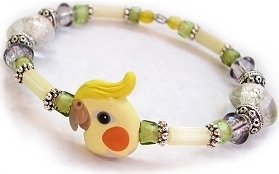 Each unique bracelet in this style includes beautiful glass beads in your choice of color scheme, along with your chosen bird(s) face, slid over stainless steel memory wire. 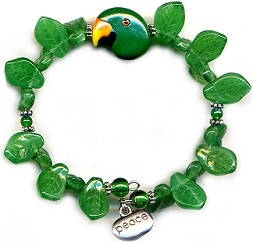 Memory wire holds it's round shape to your wrist, so a clasp is not necessary, as the bracelet stays on the wrist nicely. 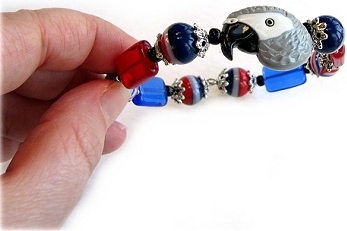 This is a great option for those of us who don't like to struggle getting tricky clasps closed! 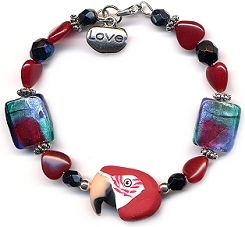 A small lobster clasp can be added however if you prefer extra security, such as the example below. 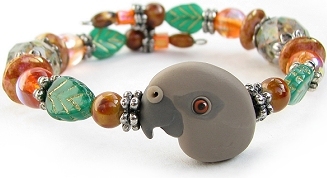 Alicia has a large collection of many shapes and styles of glass beads to choose from. You are welcome to request any particular shape, color or style that you prefer. 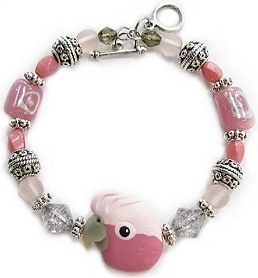 Dangling charms can also be included, such as the inspirational word charms seen in some of the examples on this page. 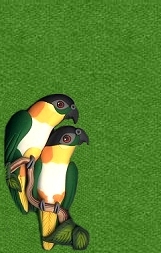 Each bird face is hand sculpted from polymer clay, and is flat on the back where it is signed and dated. An optional glossy finish can be applied for a shiny finish to the bird. 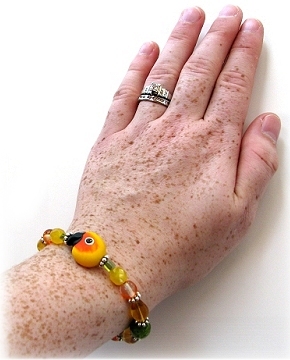 Most bracelets in this style can accommodate up to four bird faces. at sale prices, see the CREATIONS IN STOCK page.